It is a good idea to thoughtfully place several of the most important treasures, with or without monsterous guardians, and then switch to a random determination for the balance of the level. I started by eliminating what I could only assume were trap doors to underground passageways that went nowhere. I noticed the lip of the section above which I thought of as pews still seemed to suggest that the central area was sunken. I kind of like that, so I went with it by creating two small stair cases down at the aisles. I then put a dais in the middle of the room with a coffin shape on it, because after all, this is the Vile Crypt of the Reawakened Sisterhood. 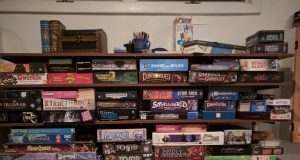 This got me thinking that if I made the longer boxes above into two smaller boxes it looks like rows of coffins, and I liked the visual of the players having to walk down the creepy aisle of coffins to get into the sunken crypt below. In fact, maybe those big circle areas are large communal burying pits for the lesser servants of the leader. Perhaps that makes the weird shape around 25 a long preparation table, with the room marked (a) being where they keep the supplies for preparing the dead. 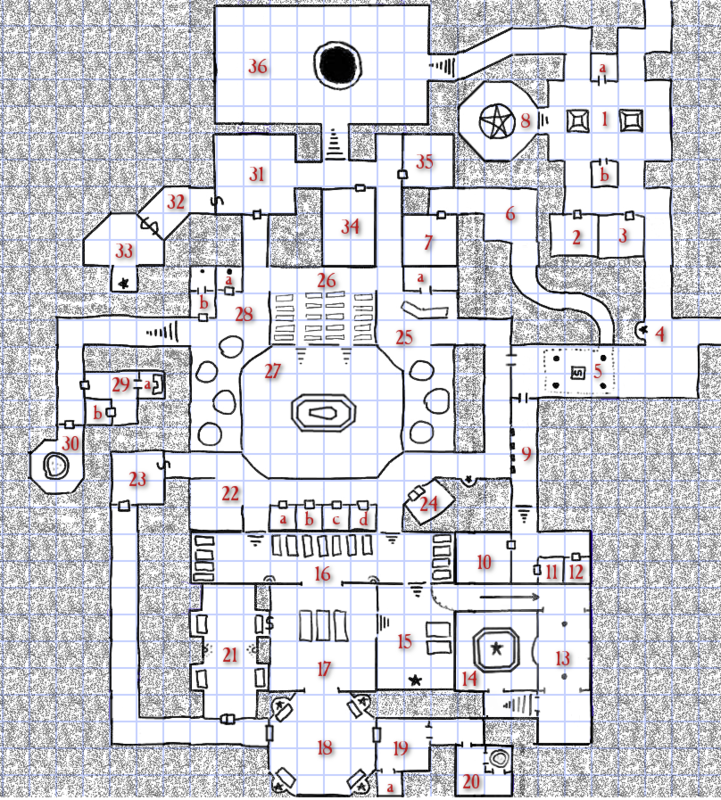 25-27 Crypt of the leader. As I try to write this I realize I still have a lot of questions still to answer about her. Does she sleep in the coffin like a vampire? Does she have undead minions in addition to the lesser forms of her race and her mindless thralls? I’d rather keep the tone more vampire or ghost like, with the creatures being fairly close to their original appearance rather than rotting corpses, so I’ll have to figure out how that aligns with all the coffins. 14 Sunken private temple of the leader. I’m thinking that while area 27 is like her throne room, these are her private chambers. Perhaps 15 is the crypt of her personal guard. 23 I still like the idea of this room being very tall, and the secret door while at floor level in 22 is up 15-20 feet in 23. Perhaps this is a treasury guarded by gargoyles lurking on a ledge high up around the walls. Behind one gargoyle is a secret door back into 22. 33 This area is very secret — I think I’d like it to be a small light in an otherwise very dark place. Perhaps the creators of this tomb hoped to seal the Sisterhood in, and they created a small chapel to a good god here to act as a sentinel. As you can see, at this point my ideas are still quite vague. And I may let them remain this way for a while, and instead turn to filling in the less important areas with random generation. Sometimes the random generation will help solidify what’s nearby, so for now I think this is enough. 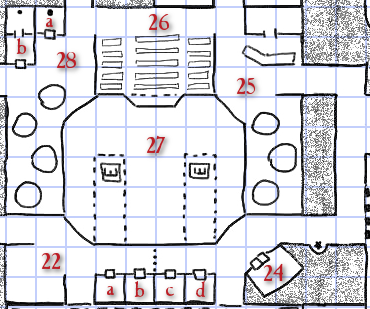 So for now, I will finish up with a small logistical task: putting the map and details so far into my standard template. 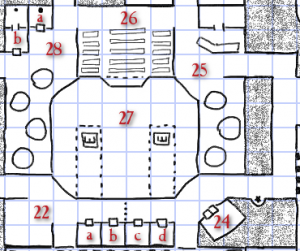 This template is built really for smaller maps to do one page dungeons, but it’s pretty easy to let the map grow and the key to fill in a second page or two if required. Though I do tend to write these things in the OPD style, trying to keep my text as minimal as possible to fit on fewer pages and leave more open to improvisation at the table. Here’s a link to the prepped template as an ODT file if you care to take a look. 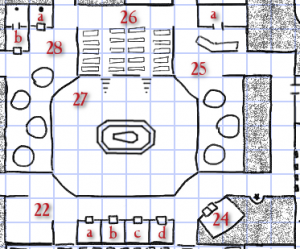 It’s pretty straight forward, just the map, the key, and a blank wandering monster table. While it looks quite empty, getting the template prepped really helps me martial my work. I can now see exactly how many rooms are left to fill, making my progress really measurable. It’s a small thing, but once my dungeon is in the template I really start to feel like I’m closing in on completion and it’s all down hill from here.